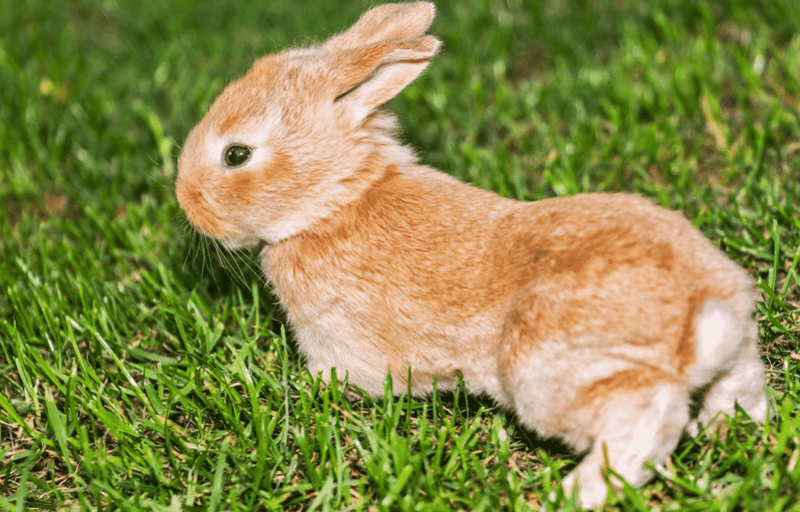 Once you decide on the breed of a bunny that you like and the best rabbit cage or an outdoor hutch which will be a suitable home, an important question comes to mind: what is the best rabbit food? 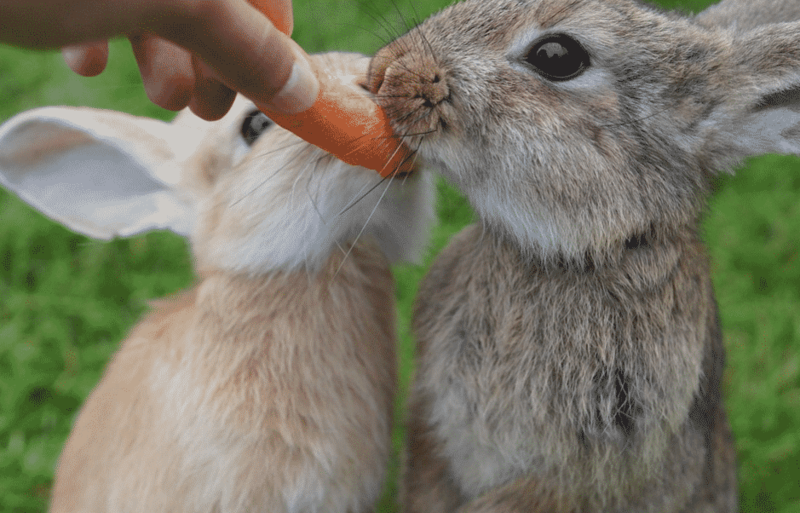 In order to meet all the dietary needs of your fluffy companion, you need to learn a thing or two about what a healthy bunny diet consists of. 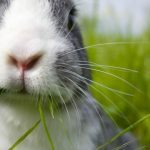 How to choose the best rabbit food? The main components of a healthy rabbit diet are good quality hay, pellets, fresh fruits and veggies and constant supply of water. 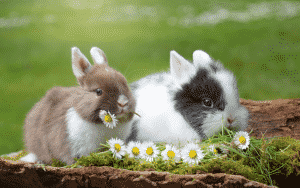 Bunny diet should contain two main food groups: about 80% of your bunny’s diet should be grass or hay. The other 20% is made up of a combination of fresh foods (vegetables and plants) and commercial, dry food like pellets. 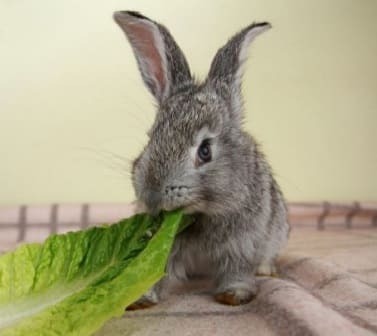 Whenever a fellow pet parent asks me: “What can I feed my rabbit?”, I always say that figuring out what to feed rabbits is very easy, but you need to stick to the right ratio and regime if you want to keep your rabbit in good health. Way too many bunny owners go for too many pellets and mixes which might contain favorite rabbit snacks but have either too little or too much nutritive value. 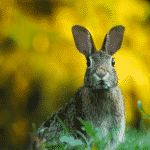 Hay is definitely the best rabbit food and the important component in the rabbit’s diet. As a rule of thumb, your bunny should have constant access to fresh hay. You can serve them Timothy, Wheaten, Oaten, Paddock, Pasture, Meadow, and Ryegrass hay. Alfalfa hay has a higher protein level than other hays. It’s fattening but should be given to underweight or growing rabbits. As for the daily quantity of hay, you can simply serve your bunny a portion of hay which is about the same size as their body. Providing your bunny with sufficient amounts of hay every day promotes healthy digestive function and proper diet. In addition, hay is rich in vitamin A, so you don’t need to worry whether your bunny will get enough vitamin A from veggies. Fortunately, good quality hays are affordable and readily available. They usually come compressed so, once you open the bag, you should keep hay well ventilated so it doesn't get mold. A simple cardboard box will do. When trying to figure out whether the hay is good, take a look at its color. Good hay is a pale green to pale gold color. If it appears dull and brown, there is a good chance the hay has been rained on whilst drying. Don’t let the edges of the bale fool you: the hay at the edges may have been a little bleached by daylight so inspect the heart of the bale and not the outside layers. As for the pellets, you should stick to normal portions of ¼ to ½ cup of pellets a day for a 5 to the 7-pound adult bunny. Rabbits that are overweight will need restricted pellets while babies and growing bunnies, as well as underweight rabbits, can be served unlimited portions of pellets together with hay, fruits, and veggies but only the sorts which have been proven to be safe foods for rabbits. Pellets are often based on good quality hay but you should still stick to fresh hay as the main portion of your bunny’s healthy diet and serve them pellets in moderation. Good quality pellets often contain prebiotics and probiotics in order to support digestive health. For the same reason, the best rabbit food in the form of pellets shouldn’t contain loose seeds or sugary fruits. The most common types of commercial rabbit foods that are bad for the rabbit’s GI (gastrointestinal) tract are those that are high in starch and sugars because they create a change in the pH of the cecum (a small sac-like structure at the beginning of the large intestine) and eventually can throw the whole system off. The result of giving too many sugary treats may be a serious illness, from diabetes to GI disease. Foods that are notorious for causing rabbit GI problems when fed improperly are grains of any kind and legumes (beans, peas, etc). Even starchy root vegetables and fruits, if fed to excess with their high load of sugars and starch, could be a problem and should only be served as a very small part of the diet. When you are buying commercial bunny food, make sure you check the ingredients so that you can avoid low-quality cheap and possibly bad food and go for recommended ingredients which will make your bunny happy and healthy. Stick to the proven and trusted brands which have been in the pet food industry for a very long time and, of course, read our rabbit food reviews! Kaytee Timothy Complete Diet for Rabbit comes as an all pelleted formula with added vitamins and minerals to support the overall health of your bunny and help prevent picky feeding. The pelleted pieces encourage natural chewing activity to support dental health. Kaytee Timothy Complete Diet for Rabbit food is Alfalfa-free food which provides your bunny with an all-natural blend of hay that is low in calcium and protein. Your bunny needs a hay-based diet to promote a healthy digestion process and keep their teeth trim and satisfy their need to chew. Since hay should make up about 80% of their daily diet, this is a perfect product for your fluffy companion. Being Alfalfa-free, this complete diet from Kaytee doesn't contain high levels of calcium and protein which can otherwise lead to urinary tract issues and obesity in adult rabbits. Made with fiber-rich, sun-cured timothy hay and other ingredients plus vitamins and minerals, this food will meet all your bunny’s dietary needs, and then some. In addition, it is made with prebiotics as well as probiotics to promote digestive health. It is formulated to ensure your loving pet gets the proper nutrition which promises a long and healthy life. The base of Timothy Complete pelleted food is nutritious hand-selected Timothy Hay fortified with essential vitamins and nutrients that your rabbit needs on daily basis. Timothy Complete is not only rich in fiber but also high in long-lasting vitamin C.
Kaytee is a trusted, well-established brand with over 150 years of nutritional experience. You can really depend on the brand to provide your rabbit with the best rabbit food when it comes to pellets for a long and healthy life of your pet. Oxbow Animal Health Bunny Basics Essentials Adult Rabbit Pet Food is formulated to meet the specific nutritional needs of adult rabbits and help them thrive. This is another quality complete and balanced adult bunny food. It contains Timothy hay as the main component which promotes healthy diet and good digestion. In addition, all the wholesome ingredients and vital nutrients needed to meet your rabbit’s daily needs are also there. This goes if you are buying food for an adult rabbit. If you have growing, active, pregnant or nursing rabbits, we recommend going for Oxbow Essentials Young Rabbit Food. This is Alfalfa based and more nutritive for young or underweight rabbits. Since about 80% of your bunny’s diet should be hay, Oxbow uses a variety of hand-selected, high-fiber hays to enrich the life and health of your pet. This Timothy-hay based food also contains Vitamin E Supplement, Yeast Culture, Zinc Proteinate, d-Calcium Pantothenate, Manganous Oxide, Riboflavin Supplement, Biotin, Vitamin A Supplement, Manganese Proteinate, Folic Acid, Vitamin D3 Supplement, and Vitamin B12 Supplement. Oxbow Essentials Adult Rabbit Pet Food comes in 5 lb, 10 lb, and 25 lb packs. If you are introducing it as a new food for your fuzzball, mix 3 parts of your current food with 1 part new food in the first week. In the second week, you should mix 2 parts of the food you are serving now with 2 parts of Oxbow Essentials. Finally, in the third week, it’s recommended that you mix 1 part of your bunnies current food with 3 parts of Oxbow. After that mixing period, you can feed Oxbow Essentials Adult Rabbit Pet Food without worrying whether your bunny will get used to it. F.M. Brown's Tropical Carnival Gourmet Pet Rabbit Food is a vitamin-nutrient-fortified food and treat, all-in-one. Now, this is tricky because your bunny may find Tropical Carnival so yummy that you’ll have to be extra careful about the portions in order to avoid overeating. This is definitely a great quality premium gourmet food specifically formulated for the daily dietary needs of your bunny. Apart from the treats (which I’m not that happy about) this food includes fiber-rich Timothy and Alfalfa Hay Pellets and also beneficial bacteria to support good digestion. The perfect sized bites of fruits, veggies seeds, and grains, plus nutrient-rich zoo-vital biscuits will make your rabbit happy and lively. It’s good for rabbits which are 20 weeks and older. Featuring a delicious blend of hay, fruits, and oats, Tropical Carnival Rabbit Food includes apples, carrots, and sunflower seeds as well in order to provide a taste your fluffy buddy will like. However, bear in mind that pellets should constitute about 20%the of the daily diet. The main components are sun-cured timothy grass hay ground, alfalfa hay sun-cured ground, oat groats, dried papaya, dried pineapple, wheat, sunflower seeds, dried carrots, dried banana, raisins, dried sweet potatoes, pumpkin seed, dried apples, dried cranberries, wheat, wheat middlings, wheat flour, ground corn, ground oats, ground barley, corn gluten meal, dehulled soybean meal, and soybean oil. In addition, you’ll get dicalcium phosphate, brewer's dried yeast, cane molasses, calcium carbonate, algae meal, fructooligosaccharide, vitamin A supplement, vitamin D3 supplement, vitamin E supplement, vitamin B12 supplement, manganese proteinate, and iron Proteinate. I also looked into the Guaranteed Analysis and found that this gourmet food has Crude Protein (min) 13.0%, Crude Fat (min) 4.0%, Crude Fiber (max) 21.0%, Moisture (max) 12.0%, Vitamin A (min) 2,000 IU/kg, Calcium (min) 0.3%, Phosphorus (min) 0.3%, Salt (min) 0.25%, Total Lactic Acid Bacteria which are all beneficial in the ratio of (min) 75,000 CFU/g. Omega fatty acids and beneficial bacteria included in Tropical Carnival help stimulate good digestion so that your rabbit can get the most out of the nutrient-rich ingredients. As for the mix, although I’d prefer if treats weren’t included, hay, fruits, veggies, seeds do allow for a complex carbohydrates, vitamins, minerals, and fiber daily dietary needs as long as you don’t serve too much. The farm fresh veggies contain antioxidants which help maintain a healthy immune system. This food also includes the specially formulated ZOO-VITAL® Biscuits for healthy teeth and gums. Overall, a rounded food with nutrients required for the well-being of your rabbit. It’s so tasty that we suggest proceeding with caution as regards the daily portions. Vitakraft VitaSmart Pet Rabbit Food is another high-quality rabbit food. It features a super-premium range specially designed to support great health using a well-rounded feeding program for adult bunnies. One of the best rabbit food products from Vitakraft, VitaSmart contains Timothy Grass Hay, Dehydrated Carrots, Ground Wheat, Chopped Timothy Grass Hay, Carob Pods, Dehydrated Alfalfa Meal, Yeast Culture, Dried Plain Beet Pulp, Calcium Carbonate, Ground Flax Seed, and Wheat Germ Meal. And that’s not all – your rabbit will enjoy Apple Juice Concentrate fortified with Potassium Chloride, Magnesium Oxide, Vitamin A Supplement, Ground Steam-Rolled Oats, Dried Lactobacillus Acidophilus Fermentation Product, Yucca Schidigera Extract, Algae Meal, Ground Papaya, Dehydrated Parsley, Vitamin D3 Supplement, Vitamin E Supplement, Niacin Supplement, Vitamin B12 Supplement, Riboflavin Supplement, and d-Calcium Pantothenate. Vitakraft VitaSmart Complete Nutrition Pet Rabbit Food features high-fiber Timothy hay as the number one ingredient in an exciting blend of enriched pellets, mixed veggies, and whole grains designed to provide your bunnies with a healthy diet. Proudly made in the USA, this complete daily diet is fortified with Vitamins A, C, D & E as well as DHA Omega 3 Fatty Acids to promote all aspects of your rabbit’s health including skin and coat, immune health, and proper digestion. Besides providing fresh hay and a high fiber pellets daily as well as fresh water, all you need to make sure is to serve your bunny a proper ratio of all the nutritive diet ingredients and introduce Vitakraft gradually if it’s a new food on your bun’s menu. The Vitakraft food contains precisely the right amounts of nutrients and other beneficial ingredients to ensure that your rabbits live a long and healthy life. They depend on a high-fiber content, minerals, fruit, green fodder and vitamins and Vitakraft provides them all. Fiesta contains prebiotics and probiotics to support digestive health and is formulated with your bunny’s dietary needs in mind. Among other beneficial ingredients, Kaytee Fiesta Rabbit Food contains Sun-cured Timothy grass hay, sun-cured alfalfa hay, oats, soybean hulls, ground oats, ground wheat, dehulled soybean meal, sunflower seed, wheat, barley, oat groats, shelled peanuts, ground flax seed (source of omega 3), dried cane molasses, dehydrated carrots, raisins, dried bananas, dried papaya, safflower seed, ground rice, dried pineapple, pumpkin seed, and dehydrated sweet potatoes. If you are introducing Kaytee Fiesta Rabbit Food as a new food, begin with a mixture of old and new food, you should gradually increase the amount of new food over a 7 to 10 day period. This will prevent digestive upset and allow your pet to adjust to the new food. For best results throw away any uneaten portion and clean your bunny’s food dish before next feeding. Make sure to adjust the portions to maintain proper weight and if you have more bunnies to feed. This naturally preserved product needs some attention to maintain maximum freshness. After opening bag, remember tp remove air from package and reseal it tightly. Make sure to use all the food within 30 - 45 days and store it in a cool and dry place. Your rabbit will enjoy it and you will be happy to have a healthy and active furry companion.